NEW YORK, New York — Rounding out a month of numerous projects completed specifically in time for the new academic year, the Hayastan All-Armenian Fund’s Syrian affiliate made Yerevan’s No. 56 School’s students and teachers particularly happy to be back in the classroom with the establishment of one in particular: an audiovisual learning facility. September 10 marked the festive ribbon-cutting ceremony for the computer room, one attended by many dignitaries and guests including Hranush Hakobyan, Armenia’s minister of Diaspora Affairs; Ara Vardanyan, executive director of the Hayastan All-Armenian Fund; Hrair Muradian, chairman of the Fund’s Syrian affiliate; Gayane Soghomonyan, head of the Yerevan Municipality’s Education Department; Hamlet Margaryan, administrator of Yerevan’s Arabkir district; Grigor Shahnazaryan, deputy administrator of the same district; and several alumni of the school. The maiden project of the Syrian affiliate launched in April 2009, the donation is worth about $22,000 and comprises 20 latest-model computers, a printer, a scanner, a DVD player, a television set, projectors, computer desks, and chairs. Following the ribbon-cutting ceremony, the guests looked on with pride as upper-level students used their new computers to write individual essays on the theme of benevolence. A highly dedicated faculty and academic excellence are hallmarks of the No. 56 School. In addition to its core curriculum, for the past 15 years it has offered free afterschool classes in physics, chemistry, history, French, and needlecraft in addition to physical education programs. The No. 56 School is also a longtime and proud host of a myriad of cultural events, starting with its own choir that frequently performs in concerts. An emphasis is placed on the student body’s acquisition of a deeper awareness of Armenian history and culture, thus the 14-year-long student and teacher participation in the Hayastan All-Armenian Fund’s National Giving drive is not incidental. 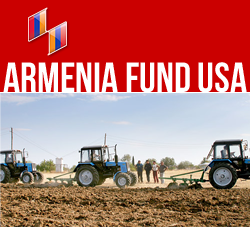 The entire student body and faculty annually joins forces to make monetary contributions to projects carried out by the Hayastan All-Armenian Fund in Armenia and Artsakh, eagerly greeting this opportunity to support the cultural preservation achieved by the Fund’s infrastructural development projects.